The G Series Red shaft with X Directional Technology (XDT) is the next generation of premium Graphite Design shafts and is designed to be very adaptable to today’s new head technology. Available in six weight categories, the G-Series wood shafts offer a wide range of shaft weights and launch angle characteristics to golfers of all skill levels. The G Series lighter weight 40g and 50g series offer a mid/high launch angle, the mid weight 60g and 70g series produce a piercing mid launch trajectory and the heavier 80g and 90g series favors a low/mid ball flight. Graphite Design’s latest technology, X Directional Technology (XDT) incorporates the use of the already proven Graphite Design MSI (Material Stiffness Integration) design method as well as this new and unique application of graphite fiber ply angle alignment throughout the shaft structure. During the development phase of XDT, measurable performance gains were discovered through a more balanced distribution of the graphite fiber angles within the piles of the shaft design. This proprietary application of XDT has made the new G-Series the most balanced, versatile high performance golf shaft available today. 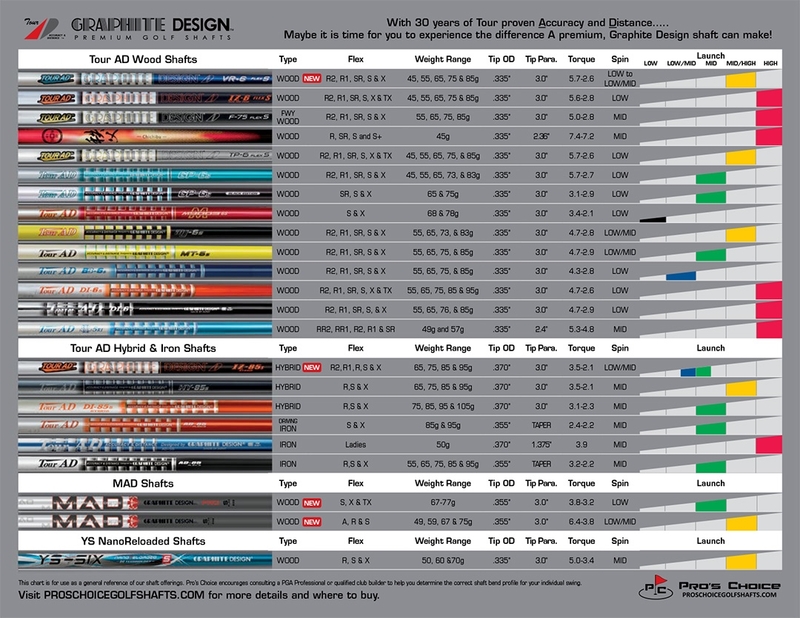 G-series and X Directional Technology (XDT), the next “Generation” in golf shaft design. XDT Technology for the most balanced, versatile high performance golf shaft available. 40 ton, high modulus, aerospace quality carbon fiber materials. Designed to be a very versatile shaft model with multiple weights and flexes to promote optimal launch angles and ball spin rates. Pro’s Choice encourages consulting a PGA Professional or qualified club builder to help you determine the correct shaft and length for your swing profile and to meet your goals. Always leave a minimum of 0.5″ of the parallel tip section of the shaft above the hosel to maintain shaft durability and prevent shaft failure/breakage. For example, if the head has a hosel bore depth of 1.5″ and the shaft has a parallel tip length of 3.0″, the tip trim length should not exceed 1.0″. Improper installation may effect the intended performance of the shaft. Warranty is for material and workmanship of our products. Improper installation voids warranty of product.